At a presentation at Embedded Linux Conference Europe, Ronald Minnich, a Google software engineer reported that systems using Intel chips that have AMT, are running MINIX. So, what’s it doing in Intel chips? A lot. These processors are running a closed-source variation of the open-source MINIX 3. We don’t know exactly what version or how it’s been modified since we don’t have the source code. Buried deep inside your computer’s Intel chip is the MINIX operating system and a software stack, which includes networking and a web server. It’s slow, hard to get at, and insecure as insecure can be. Maybe you’re not paranoid. Maybe they are out to get you. Ronald Minnich, a Google software engineer, who discovered a hidden MINIX operating system inside “kind of a billion machines” using Intel processors, might agree with this. Why? Let’s start with what. In May, we found out that AMT had a major security flaw, which had been in there for nine — count ‘em — nine years. Quick! How many of you patched your PC or server’s chip firmware? Right. The Electronic Frontier Foundation (EFF) has called for Intel to provide a way for users to disable ME. But Minnich found that what’s going on within the chip is even more troubling. At a presentation at Embedded Linux Conference Europe, he reported that systems using Intel chips that have AMT, are running MINIX. So, what’s it doing in Intel chips? A lot. These processors are running a closed-source variation of the open-source MINIX 3. How? MINIX can do all this because it runs at a fundamentally lower level. x86-based computers run their software at different privilege levels or “rings”. Your programs run at ring three, and they have the least access to the hardware. The lower the number your program runs at, the more access they have to the hardware. Rings two and one don’t tend to be used. Operating systems run on ring zero. Bare-metal hypervisors, such as Xen, run on ring -1. Unified Extensible Firmware Interface (UEFI) runs on ring -2. MINIX? It runs on ring -3. Positive Technologies, which in September said it has a way to drill into Intel’s secretive Management Engine technology buried deep in its chipsets, has dropped more details on how it pulled off the infiltration. For those who don’t know, for various processor chipset lines, Intel’s Management Engine sits inside the Platform Controller Hub, and acts as a computer within your computer. It runs its own OS, on its own CPU, and allows sysadmins to remotely control, configure and wipe machines over a network. This is useful when you’re managing large numbers of computers\, especially when an endpoint’s operating system breaks down and the thing won’t even boot properly. Getting into and hijacking the Management Engine means you can take full control of a box, underneath and out of sight of whatever OS, hypervisor or antivirus is installed. This powerful God-mode technology is barely documented and supposedly locked down to prevent miscreants from hijacking and exploiting the engine to silently spy on users or steal corporate data. Positive says it’s found a way to commandeer the Management Engine, which is bad news for organizations with the technology deployed. For some details, we’ll have to wait, but what’s known now is bad enough: Positive has confirmed that recent revisions of Intel’s Management Engine (IME) feature Joint Test Action Group (JTAG) debugging ports that can be reached over USB. With knowledge of the firmware internals, security vulnerabilities can be found and potentially remotely exploited ta a later date. Intel’s Management Engine (ME) technology is built into almost all modern Intel CPUs. At the Embedded Linux Conference, a Google engineer named Ronald Minnich revealed that the ME is actually running its own entire MINIX OS and that Google is working on removing it. Due to MINIX’s presence on every Intel system, the barebones Unix-like OS is the most widely deployed operating system in the world. Intel’s ME technology is a hardware-level system within Intel CPUs that consists of closed-source firmware running on a dedicated microprocessor. There isn’t much public knowledge of the workings of the ME, especially in its current state. It’s not even clear where the hardware is physically located anymore. Intel’s Management Engine (ME) technology is built into almost all modern Intel CPUs. At the Embedded Linux Conference, a Google engineer named Ronald Minnich revealed that the ME is actually running its own entire MINIX OS and that Google is working on removing it. Due to MINIX’s presence on every Intel system, the barebones Unix-like OS is the most widely deployed operating system in the world. Intel’s ME technology is a hardware-level system within Intel CPUs that consists of closed-source firmware running on a dedicated microprocessor. There isn’t much public knowledge of the workings of the ME, especially in its current state. It’s not even clear where the hardware is physically located anymore. At its inception in 2006, the ME was reportedly located on the MCH (northbridge), but when that became integrated into the CPU beginning with Nehalem, ME was moved to the PCH (current-day “southbridge”). Where the ME’s code is stored also isn’t clear. Intel has said that it, at least at one point, was loaded into system DDR RAM. The ME has access to many, if not all, of the platform’s integrated devices, such as Intel network controllers. It can also access the main system RAM (the DDR RAM) through DMA. Much has changed in Intel’s platform since some of this was reported, however, so the state of ME now isn’t well understood. Intel, of course, keeps many of the details veiled in secrecy for security purposes. Are you reading this on a machine running a GNU/Linux distribution? A Windows machine? Or perhaps an Apple OS? 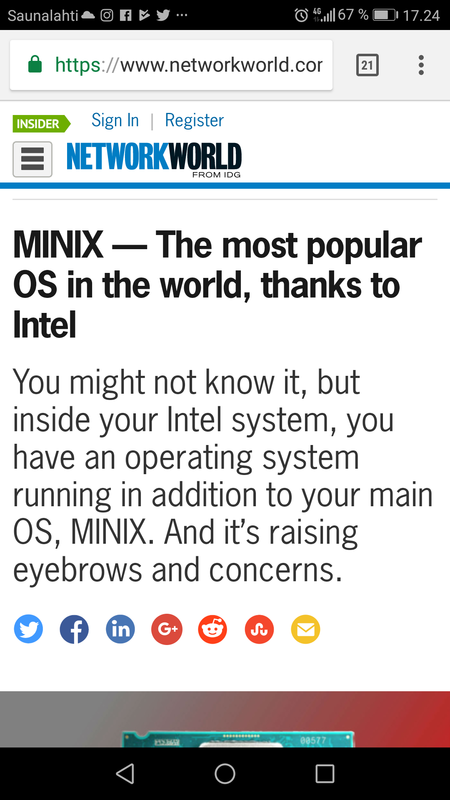 It doesn’t really matter, because your computer is probably running MINIX anyway. the onboard functions. Intel processors have had one for years, it’s called the Management Engine, or ME, and it has its own firmware baked into the chip. It is this firmware, that according to a discovery by [Ronald Minnich], contains a copy of the MINIX operating system. Well, crap. It might have finally happened. [Maxim Goryachy] and [Mark Ermolov] have obtained fully functional JTAG for Intel CSME via USB DCI. What the hell does that mean? It means you can plug something into the USB port of a computer, and run code on the Intel Management Engine (for certain Intel processors, caveats apply, but still…). This is doom. The Intel ME runs below the operating system and has access to everything in your computer. If this is real — right now we only have a screenshot — computer security is screwed, but as far as anyone can tell, me_cleaner fixes the problem. Also, Intel annoyed [Andy Tanenbaum].